What are the Wands of Horus? Timendi causa est nescire - Seneca "Ignorance is the cause of fear." Some of us consume cannabis for its mind-altering effects, while others seek symptom relief. But cannabis wouldn’t get us high or have some of its therapeutic benefits if our bodies didn’t already contain a biological system capable of interacting with its active chemical compounds, like THC. Our endocannabinoid system does just that. But it isn’t there just to allow us to enjoy the effects of our favorite strain. It serves a vital purpose for our health and well-being because it regulates key aspects of our biology. So, what’s it doing, and how does it work? To understand the human endocannabinoid system, it’s helpful to know a little about one of the most fundamental concepts in biology: homeostasis. And the best way to understand homeostasis is to think of Goldilocks and the three bears. Homeostasis is the concept that most biological systems are actively regulated to maintain conditions within a narrow range. Our body doesn’t want its temperature to be too hot or too cold, blood sugar levels too high or too low, and so on. Conditions need to be just rightfor our cells to maintain optimum performance, and exquisite mechanisms have evolved to draw them back to the Goldilocks zone if they move out. The body’s endocannabinoid system (ECS) is a vital molecular system for helping maintain homeostasis—it helps cells stay in their Goldilocks zone. Key Pieces of the Endocannabinoid System (ECS)Because of its crucial role in homeostasis, the ECS is widespread throughout the animal kingdom. Its key pieces evolved a long time ago, and the ECS can be found in all vertebrate species. Cannabinoid ReceptorsCannabinoid receptors sit on the surface of cells and “listen” to conditions outside the cell. They transmit information about changing conditions to the inside of the cell, kick-starting the appropriate cellular response. 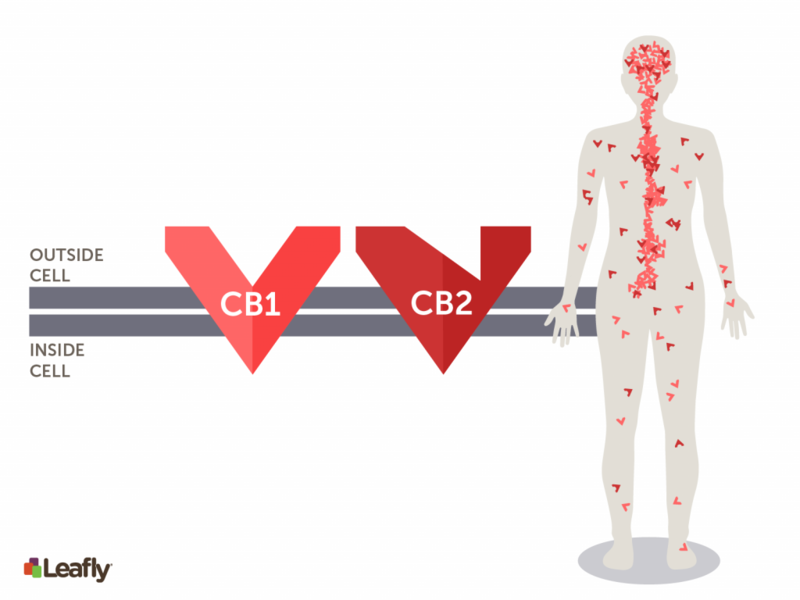 There are two major cannabinoid receptors: CB1 and CB2. These aren’t the only cannabinoid receptors, but they were the first ones discovered and remain the best-studied. CB1 receptors are one of the most abundant receptor types in the brain. These are the receptors that interact with THC to get people high. CB2 receptors are more abundant outside of the nervous system, in places like the immune system. However, both receptors can be found throughout the body (Figure 1). Figure 1: Where are CB1 and CB2 receptors located in the body? The CB1 and CB2 receptors are key players in the endocannabinoid system (ECS). They are located on the surface of many different types of cells in the body. Both receptors are found throughout the body, but CB1 receptors are more abundant in the central nervous system, including on neurons in the brain. 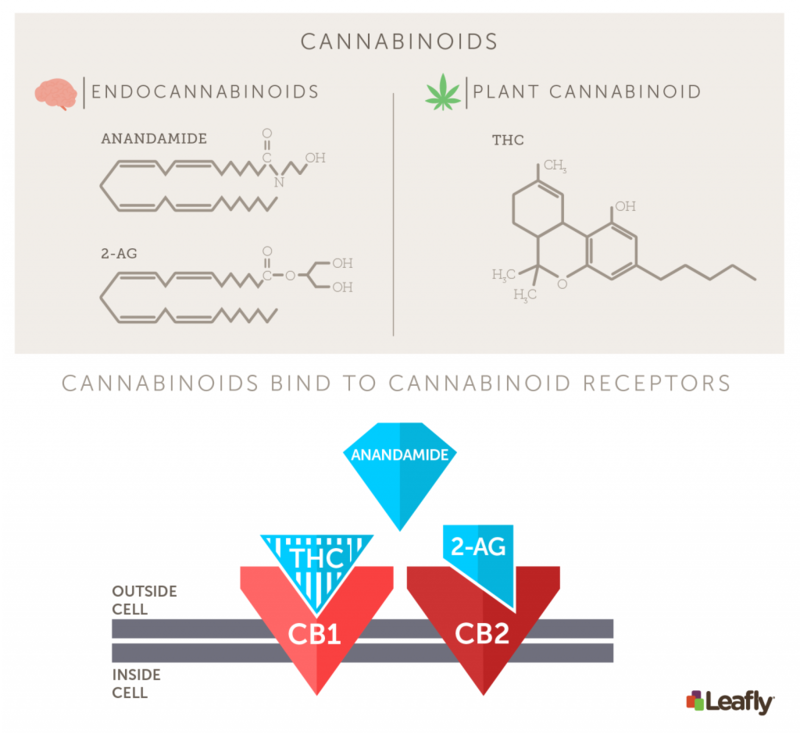 In contrast, CB2 receptors are more abundant outside of the nervous system, including cells of the immune system.EndocannabinoidsEndocannabinoids are molecules that, like the plant cannabinoid THC, bind to and activate cannabinoid receptors. However, unlike THC, endocannabinoids are produced naturally by cells in the human body (“endo” means “within,” as in within the body). There are two major endocannabinoids: anandamide and 2-AG (Figure 2). 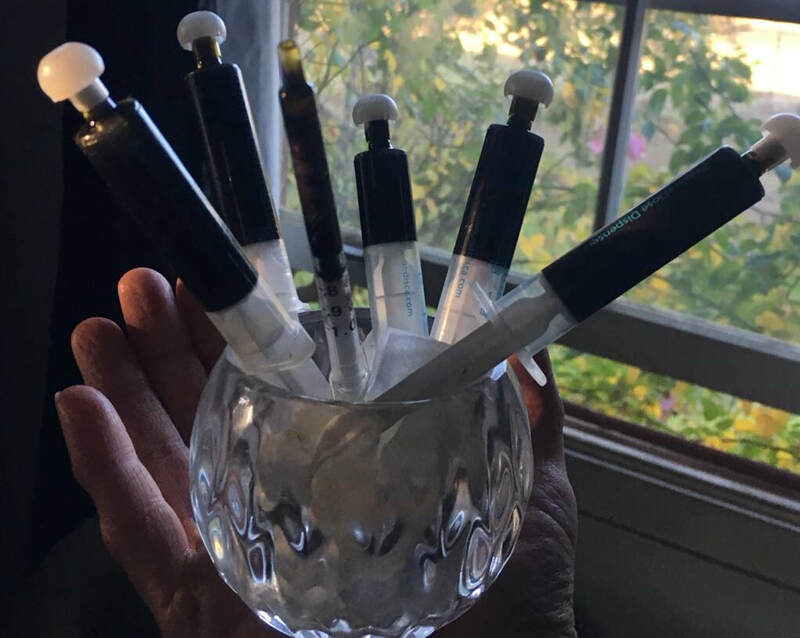 These endocannabinoids are made from fat-like molecules within cell membranes, and are synthesized on-demand. This means that they get made and used exactly when they’re needed, rather than packaged and stored for later use like many other biological molecules. Figure 2: Anandamide and 2-AG are the two major endocannabinoids. Cannabinoids are a class of molecules characterized by their ability to activate cannabinoid receptors like CB1 and CB2. Anandamide and 2-AG are the two major endocannabinoids produced naturally in the body. THC is the psychoactive plant cannabinoid produced by Cannabis. All three of these cannabinoids can activate the CB1 and CB2 receptors, although each one has a different potency at each receptor.Metabolic EnzymesThe third piece of the endocannabinoid triad includes the metabolic enzymes that quickly destroy endocannabinoids once they are used. The two big enzymes are FAAH, which breaks down anandamide, and MAGL, which breaks down 2-AG (Figure 3). These enzymes ensure that endocannabinoids get used when they’re needed, but not for longer than necessary. This distinguishes endocannabinoids from many other molecular signals in the body, such as hormones or classical neurotransmitters, which can persist for many seconds or minutes, or get packaged and stored for later use. 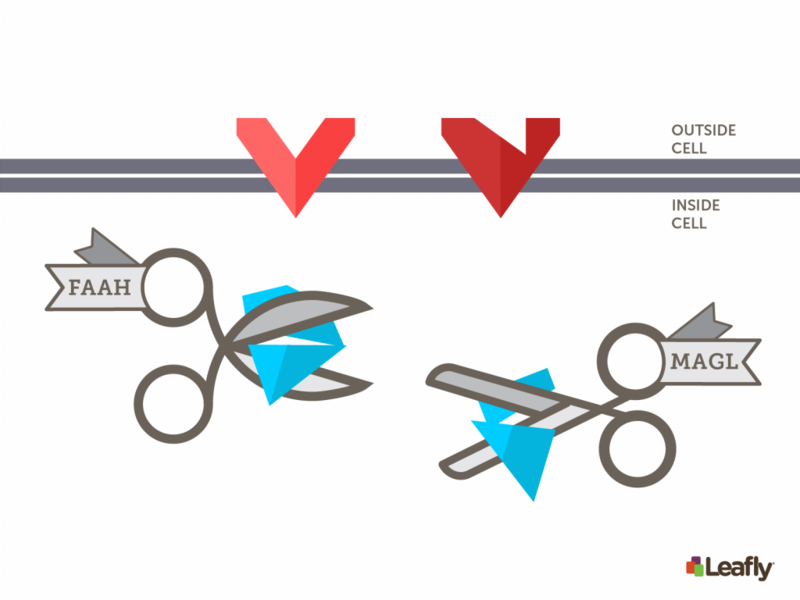 Figure 3: FAAH and MAGL are the key enzymes of the endocannabinoid system. In other words, the ECS helps bring things back to the biological Goldilocks zone. 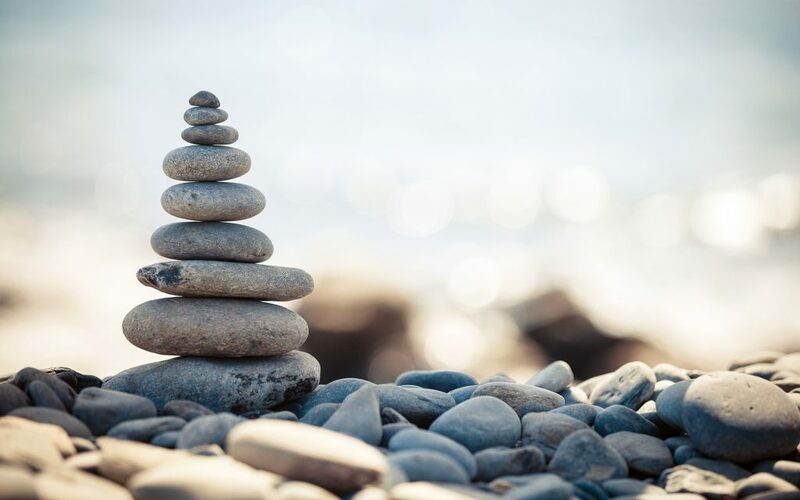 Below we will consider examples of how the ECS helps maintain homeostasis in two areas: the firing of brain cells in the nervous system, and the inflammatory response of the immune system. Endocannabinoid Regulation of Brain Cell FiringBrain cells (neurons) communicate by sending electrochemical signalsto each another. Each neuron must listen to its partners to decide whether it will fire off its own signal at any given moment. However, neurons don’t like to get too much input—there’s a Goldilocks zone. If they get overloaded by signals, it can be toxic. That’s where endocannabinoids come in. Consider a simplified scenario with one neuron listening to two others. One of these two neurons might become overactive and send too many signals to the neuron that’s listening. When that happens, the neuron that’s listening will make endocannabinoids specifically where it’s connected to the overactive neuron. Those endocannabinoids will travel back to the “loud” neuron where they bind to CB1 receptors, transmitting a signal that instructs it to quiet down. This brings things back to the Goldilocks zone, maintaining homeostasis (Figure 4). Figure 3: Endocannabinoid signals regulate how active our brain cells are. Under normal circumstances (top-left), a given brain cell (neuron) will get just the right amount of input from its partners—not too much, not too little. However, some of its partners can become overactive, and send an excessive number of signals (top-right). The neuron that’s listening will detect this, and release endocannabinoids that tell the other neuron to quiet down (bottom). This kind of mechanism helps maintain homeostasis because it helps prevent neurons from sending out too many signals.As the example above illustrates, endocannabinoids travel backwards, which is why they’re known as retrograde signals. Most of the time, information flow between neurons is strictly in one direction, from “sender” neurons that release neurotransmitter signals to “receiver” neurons that listen to those signals. Endocannabinoids allow receiver neurons to regulate how much input they’re getting, and they do this by sending retrograde signals (endocannabinoids) back to overactive sender neurons. But the brain isn’t the only organ that needs to maintain homeostasis. Every other system of the body, from the digestive to the immune system, needs to carefully regulate how its cells are functioning. Proper regulation is crucial for ensuring survival. Endocannabinoid Regulation of InflammationInflammation is a natural protective reaction the immune system has in response to infection or physical damage. The purpose of inflammation is to remove pathogens (germs) or damaged tissue. The inflamed area is produced by fluid and immune cells moving into the area to do the dirty work and return things to their Goldilocks zone. It’s important that inflammation be limited to the location of damage and doesn’t persist longer than needed, which can cause harm. Chronic inflammation and auto-immune diseases are examples of the immune system getting activated inappropriately. When that happens, the inflammatory response lasts too long (which results in chronic inflammation) or gets directed toward healthy cells (which is known as auto-immunity). In general, endocannabinoids seem to suppress or limit the immune system’s inflammatory signals. Professor Prakash Nagarkatti, Vice President for Research at the University of South Carolina whose laboratory studies endocannabinoid regulation of immune responses, told us how tweaking the ECS might be a good way to treat inflammatory diseases. Consider a normal immune response triggered by a bacterial infection. First, immune cells detect the presence of bacteria and release pro-inflammatory molecules that tell other immune cells to come and join the fight. 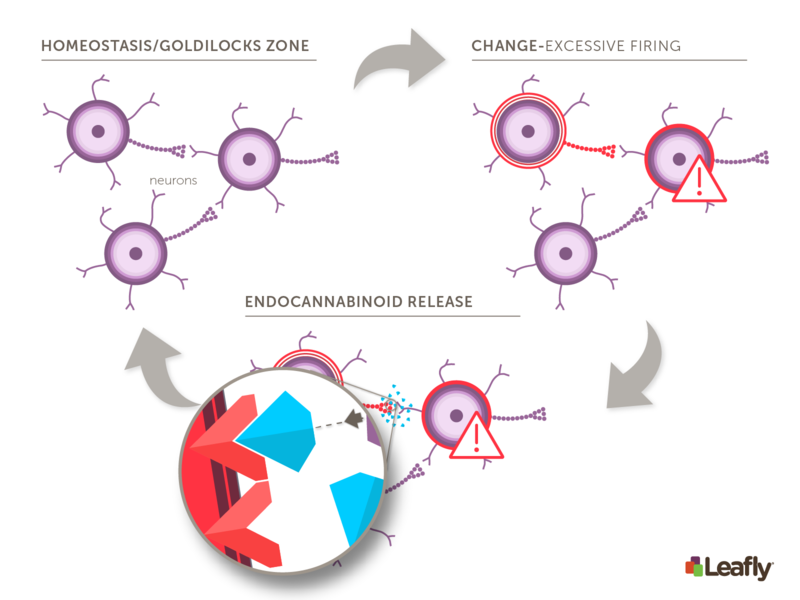 Endocannabinoids get released as well (Figure 4), which also signal to other immune cells for assistance and likely help limit the inflammatory response so it isn’t excessive. By tightly regulating inflammation, the immune system can destroy germs or remove damaged tissue, and then stop. This prevents excessive inflammation, allowing cells, and thus the body, to return to the Goldilocks zone. Figure 4: Endocannabinoids help regulate inflammation. Under normal conditions (top-left), cells of the immune system patrol the body, on alert for any intruders, such as bacteria. During a bacterial infection (top-right), immune cells detect the presence of bacteria and then release a variety of molecules to help mount a defensive attack (bottom). These signals include pro-inflammatory molecules (small circles) that help recruit more immune cells to the site of infection. 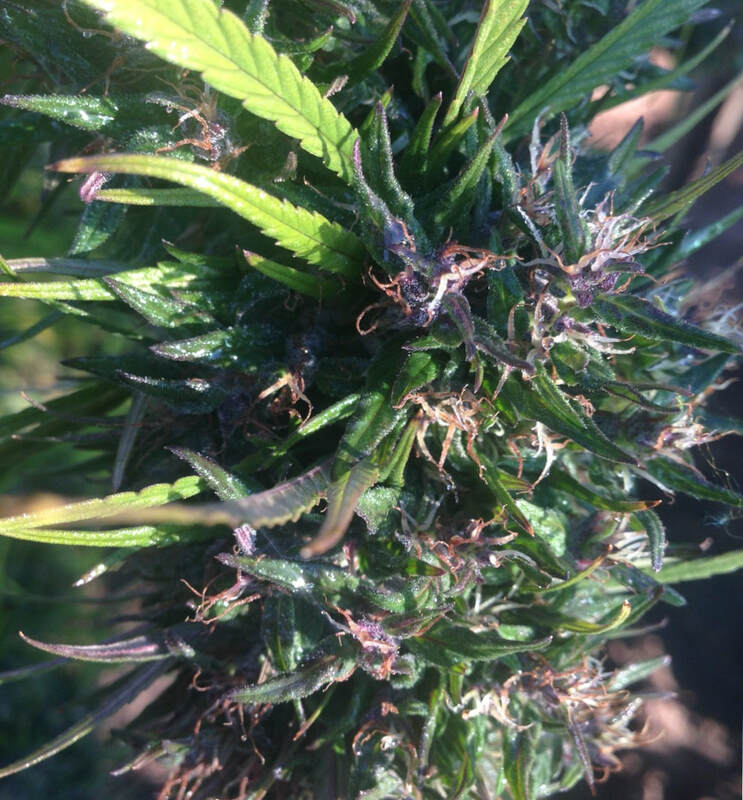 Endocannabinoids (small diamonds) also get released, and likely help regulate the magnitude and extent of this inflammatory response.How Do Plant Cannabinoids Like THC and CBD Interact with the Endocannabinoid System?The reason that plant cannabinoids have psychoactive and medicinal effects within the body is, in large part, because we have an endocannabinoid system (ECS) that they can interact with. For example, THC gets you high because it activates the CB1 receptor within the brain. Endocannabinoids like anandamide also activate CB1. So why aren’t we constantly high? A couple big reasons. First, THC doesn’t interact with CB1 receptors in exactly the same fashion as the body’s natural endocannabinoids. Second, the metabolic enzymes that quickly break down endocannabinoids like anandamide don’t work on THC, so THC lingers around for much longer. It’s important to remember that molecules like cannabinoids and other neurotransmitters rarely interact with only one receptor type; they often interact with many. The plant-based cannabinoid CBD illustrates this nicely, as it interacts with numerous receptor types in the brain. So, while plant cannabinoids may activate the same cannabinoid receptors as endocannabinoids, they will likely interact with several other receptors and therefore have distinct effects. CBD is also interesting because it can affect overall levels of endocannabinoids in the brain, referred to as “endocannabinoid tone.” CBD inhibits the FAAH enzyme, which breaks down anandamide. Thus, CBD can increase anandamide levels by preventing FAAH from breaking it down. Inhibiting the FAAH enzyme has been shown to be a useful strategy for treating anxiety disorders, and some of CBD’s anti-anxiety properties may come from its ability to inhibit this enzyme and thereby increase endocannabinoid tone. SummaryThe endocannabinoid system (ECS), comprised of cannabinoid receptors, endocannabinoid molecules, and their metabolic enzymes, is a crucial molecular system that the body uses to help maintain homeostasis. Because of its vital role in making sure that cells and systems remain in their physiological Goldilocks zone, the ECS is tightly regulated; it gets deployed exactly when and where it’s needed. However, this doesn’t mean that activating the ECS, through consumption of cannabis or by any other means, will always make things just right. It’s important to remember that activating the ECS, through cannabis consumption or by any other means, isn’t a cure-all. Like most of biology, it’s complicated. 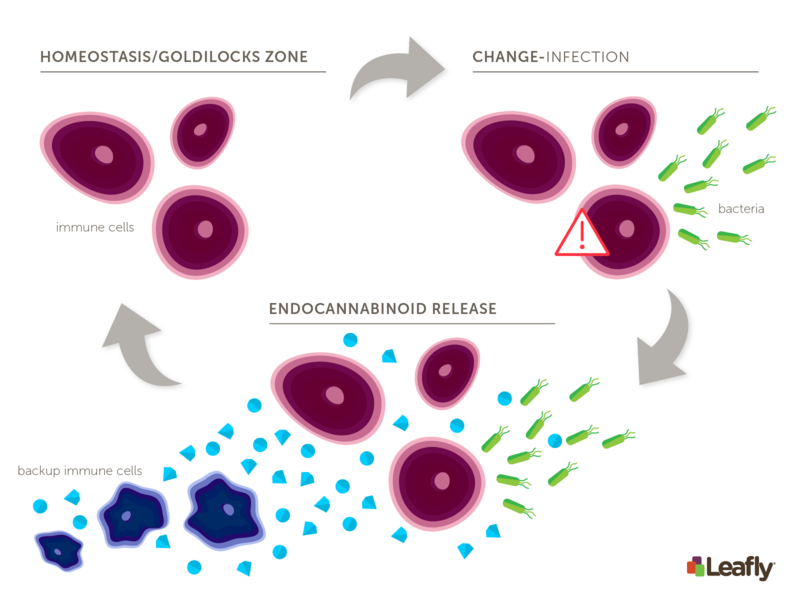 By understanding the biological Goldilocks principle (homeostasis), and how the ECS illustrates this at the cellular level, we can more deeply appreciate why we have an ECS to begin with, and how a variety of cannabis-based therapies might actually work. The presence and critical function of the ECS across many systems of the body, including the nervous and immune systems, explains why such a wide variety of ailments and disease states are responsive to cannabis-based interventions.